In a posting from April 22, I wrote about the “secret ingredient” in so many of my grandmother’s recipes - Red Pepper Paste. The original method of preparation is time-consuming - and messy, so I offered a simpler, neater version of the recipe. An anonymous reader of the Armenian Kitchen requested the original, lengthy version of how to make red pepper paste, so here it is, and don’t say I didn’t warn you! Please note: it’s best to make this in late September when red peppers are at their peak (depending on where you live, of course) and prices are low. Also note that the amounts given for salt and cayenne pepper are vague, because Nanny never measured; she could tell by taste when things were just right. 1. Wash peppers. Remove seeds and white membrane. Rough cut peppers to fit into a hand grinder or food processor. You’ll need a large pan to collect the ground-up pepper “mash”. 2. Add salt, tasting as you go, so as not to overdo it. 3. Stir in cayenne pepper to taste, if using. Be very careful; this stuff is HOT! The pepper mash should have a little “kick” to it, but it shouldn‘t make you cry. Cooking: You might need to cook in batches, depending on the amount of red pepper mash you end up with. 1. Place mash in a large pot and cook on medium heat, stirring constantly with a wooden spoon, until the amount reduces. Be very careful not to burn the mash during this process, which will take a very long time - hours, in fact. 2. When the mash resembles the thickness of ketchup, remove it from the heat, and transfer it to large, flat cookie sheets with 1-inch sides. Spread the mash evenly. 3. Take the cookie sheets outside and allow to dry in the sun for 2 to 3 days. SPECIAL NOTE: Nanny monitored this process diligently, making sure no insects or other outdoor debris came in contact with the pepper mash. She always brought the trays inside if there was a hint of moisture in the air, and after dark. Also note: if making this in hot, dry weather, the drying process shouldn’t take as long. Becoming a Paste: When the mash is dried, it takes on the form of a thick paste. 1. Place red pepper paste in sterile jars. Leave the jars open a few more days in the sun. 2. Before sealing the jars, pour some olive oil to cover the surface. Seal jar tightly with lid. 3. Refrigerate after opening, or freeze. How to freeze red pepper paste: The trick is to use plastic ice cube trays. Place about a tablespoonful of paste in each ice cube compartment. Cover with heavy freezer wrap or place in freezer plastic bags, and place trays in freezer. 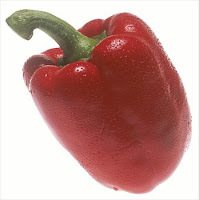 When ready to use, remove the number of red pepper paste cubes you need & defrost in the refrigerator. Keep the other “cubes” frozen until needed. What to use red pepper paste in: Sarma Gurgood- Nanny's version of Tabbouleh, potato salad, soup, stew, Banerov Hatz, bulgur recipes, dips, spreads - or whatever recipe your heart desires! Not for me, the long way, but this is priceless! Have you got any more "vintage" recipes? It's terrific to see how it was "really" done. Thank you.